Over the past few days, I was privileged to have read another masterpiece of a book – “Common Stocks and Uncommon Profits” by the legendary investor Philip Fisher – the father of growth investing. A complete opposite of Graham and the theory of value investment, Fisher proposes a set of 15 ‘scuttlebutt’ principles that work as a checklist for investors to evaluate companies for growth investing. There are very few companies that consistently meet the criteria of being growth companies over the long-term, and his 15 criteria act as the guide for qualifying them. Fisher’s way of investing is to identify great growth companies and hold them forever or for as long as possible. His basic premise is that the best long term investments are companies that have products and services with large markets, a strong research function to keep coming up with newer products from time to time, an effective sales engine, high profit margins, and are run by happy employees and leaders of integrity. In case one is able to identify such companies, how much you pay for it does not matter so much as long as it is not completely unreasonable, as per Fisher. Of course, such a lethal combination is tough to find. Therefore, his view is – if one finds them, hold them forever. One is more likely to find companies with these qualities and such stature in the large cap end of the market – and if one is fortunate enough to identify something like this when it is not large enough, it will multiply investments many times over. Texas Instruments and Motorola were two such investments that worked well for Fisher – both of which he bought in the early 1950’s and held on almost till his death. Obviously if you could find it, the young growth company is the best bet for superlative gains. But such scenarios are rare and also impractical. Hence, in what to buy, Fisher says it is best if small as well as large investors stick to relatively large growth companies. On when to buy, Fisher has an unusual recommendation. His premise is that the best time to buy a growth company is when its new product development is going into production. That is when a fairly large growth is in store, which most people are unaware of. So he does not get into pricing or valuation of companies as the basis for purchase, but relies more on the stage within the company for timing purchase. On when to sell, Fisher says – almost never. Investors make a number of mistakes which come in the way of uncommon profits, like selling too soon, or selling when it has gone up quite a bit – or selling in the expectation of overall market downtrend. All of which are mistakes with heavy penalties as per Fisher. When thinking of selling a growth stock, think of yourself on your graduation day from college. Let’s say you are to choose only 3 classmates who you will ‘buy’ by paying them what they would earn in the first twelve months of working, in return for which they would give you quarter of their earnings thereafter for the rest of their lives. Think of growth stocks like that is what Fisher says. It would be foolish for an investor to sell a growth stock either because it is going through a tough time, or if it has given stupendous returns. The only reasons why a growth stock should be sold is if one realizes one has made a mistake, or if the company does not qualify on one or more of the 15 scuttlebutt criteria, or if you find a relatively better growth stock. Basically if the choice is correctly made, it means that one should sell almost never. Some of Fisher’s views on buying cheap companies and dividends are completely in contrast with Graham’s quantitative approach to value investing. Most of Fisher’s assessment is qualitative. A pure value investor may not agree with his theories, perhaps find them outrageous too, but he has consistently used them over 70 years and with great results. His complete disregard to value metrics such as low price earnings or low price to book value as the basis of stock selection, and strong emphasis on growth as the only basis for long term profits is full of conviction. Both value and growth approaches have been equally effective in their own ways and, Fisher and Graham, have been legends on their own. It is, therefore, testimony that there is no single way to successful investing. 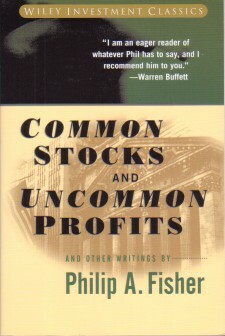 The father of growth investing – in the end – summarizes his philosophy by a very succinct quotation from Julius Caesar which I reproduce here – “There is a tide in the affairs of men which, taken at the flood, leads on to fortune.” That is perhaps Fisher’s formula for uncommon profits from common stocks.